Seoul Union Church (SUCh) is a non-denominational Council (elders) led congregational church. The Council is composed of the pastor(s) and elected members (elders) who are expected to meet the qualifications in 1 Timothy 3:1-7 and Titus 1:6-9. The church meets regularly to discuss and make decisions regarding significant issues like appointing leadership, establishing doctrine, and major financial decisions. The elders and pastor(s), supported by the church staff, provide spiritual leadership to the congregation. We have a number of committees and ministries that carry out the work of the church. Click here for a copy of our Constitution and here for our Statement of Faith. Cristian is not a catalytic “agent of change” or a visionary anything. He likes sports too much and sometimes tends to worry too much about what people think. However, he believes in the power of the Gospel of Jesus Christ to transform people, seeks to preach the whole counsel of God, and to live what he preaches. By God’s grace he continues to grow in his faith knowing that he is being surrounded by an increasing number of people who pray for him, his family, and the church. 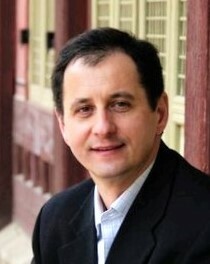 He is currently teaching Hebrew and Old Testament at Torch Trinity Graduate University in Seoul. Cristian is married to Viorica (Ica) and has four children: Isaiah, David, Talitha, and Yohanan. He enjoys reading, sports, fishing, hiking, and can be spotted biking along the Han river for most of the year.